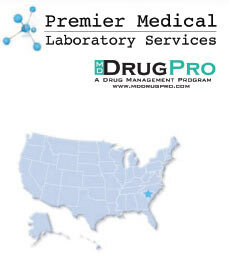 Premier Medical Laboratory Services (PMLS) offers MDHealthPro, a program that consist of MDHeartPro, MDWellnessPro, MDGeneticPro, MDAllergyPro, MDDrugPro, and MDChemistryPro. PMLS is fully certified by all the major laboratory accrediting organizations, including Clinical Laboratory Improvement Amendments (CLIA) and COLA. PMLS has the latest equipment, including liquid chromatography mass spectrometry (LCMS), Molecular, Allergy testing equipment and the highest analytical standard in the industry. This not only allows us to provide the most accurate interpretations but also the most rapid turnaround times for clinics and physicians. Our testing procedures and methods are based on scientific facts and values produced by our laboratory in which extensive data analysis and research collected and measured. Our testing procedures set us apart from our competition. We take pride in our testing procedures and customer services we offer to our clients. PMLS prides itself in providing more our clients: Fast results within the same day or to 7 -10 days with general chemistry, advance testing. Our lab uses one of the most advanced laboratory information systems (LIS) to generate easy to read one page test result reports with higher accuracy and a customizable report for each client. We can interface our LIS system to most EMR systems. This gives your clinic faster access to your result reports and helps you run your clinic more efficiently while lowering operating costs. PMLS is also proud to offer a patient friendly billing policy. Most labs charge self-pay patients higher amounts for services rendered and aggressively pursue the patients until payment is received. We charge our self-pay patients a reasonable fee and we have developed a system to help patients with payments. PMLS is committed to helping physicians provide the best care to their patients. Every day we strive to keep this commitment and to be the industry leader. We are committed to a tradition of excellence and will exemplify the highest standards of integrity, honesty, and ethical conduct in all we do. We believe our success depends upon our ability to listen and appropriately respond to the clients we serve. We invite you to give us the opportunity to develop a lasting and meaningful relationship.